BERLIN -- Closer cooperation with Harman International, a new Samsung Electronics affiliate, looks to be crucial for the tech giant to launch an “unbeatable” artificial intelligence device next year, with the chiefs of the two firms holding a closed-door meeting at the IFA 2017 in Berlin. 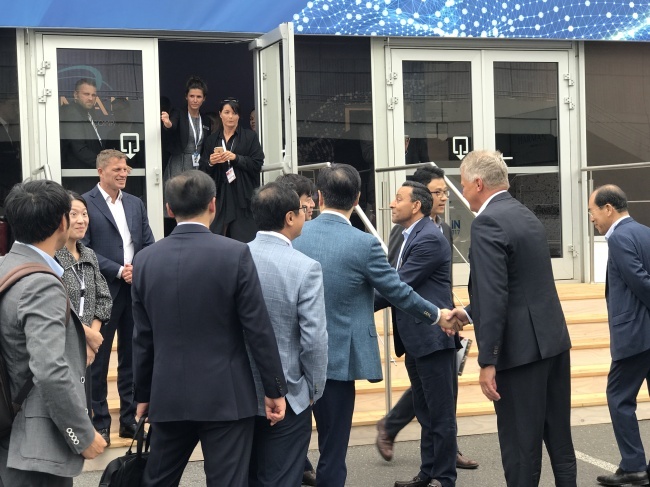 On Friday, Yoon Boo-keun, president and CEO of the consumer electronics business at Samsung Electronics, held a confidential meeting with Harman CEO Paliwal at a private venue set up by Harman exclusively for distributors and business partners. The closed-door meeting took more than half an hour. 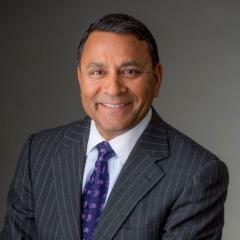 Dinesh Paliwal, CEO of Harman International, told The Korea Herald after the meeting that the talks included the ongoing collaboration on the development of the upcoming Samsung AI speaker. The Harman CEO stressed that the Samsung speaker would be a complete platform that supports operations of all kinds of home appliances and mobile devices, the ultimate goal of which is to establish an AI ecosystem. Paliwal expressed confidence in the first product to be co-developed by Samsung and Harman since the US audio and car electronics maker was acquired by Samsung for $8 billion in March. It was the biggest M&A project led by Samsung heir Lee Jae-yong to secure a new growth engine for the world’s largest provider of chips, handsets and home appliances. Paliwal added he would visit Seoul in October for meetings with top Samsung officials on the operation and management issues of Harman. Yoon and Paliwal’s meeting came a day after Yoon held a press conference, pledging to launch an unrivaled AI device next year but also expressing “devastation” about the absence of Lee Jae-yong, the de facto leader of the conglomerate who has been sentenced to five years in jail for bribery. Yoon on Friday also took an hourlong tour of booths at the 160,000-square-meter Messe Berlin by Samsung’s partners and competitors, including Miele, Bosch, Toshiba, Sony and Loewe, before reaching Harman’s private venue. The Harman room, located outside of the main exhibition hall, was closed to the press and the public. Yoon and Paliwal looked around Harman’s exhibition and moved to an observatory at the Funkturm Berlin Radio Tower located next to the Harman venue for private business talks. Being aware of the limited growth potential of the premium smartphone market, Samsung has been preparing to jump into the car electronics market. Once the Samsung-Harman AI platform hits the market, it will bring nearly all objects to an unprecedented level of connectivity, Paliwal said after their talks. Commenting that Samsung is already a company “better than Google and Microsoft” with sophisticated home appliances and wireless products and services, Paliwal said it would be unbeatable when the Samsung AI ecosystem was created.